When a tornado comes blowing through, you can sit vulnerable in a flimsy wooden box, or you can be like a turtle, pulling its head and limbs into its impervious shell. 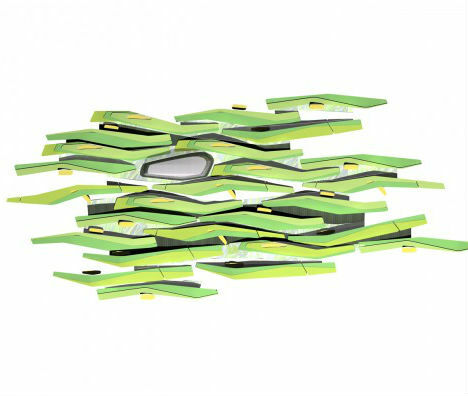 Turtles were among the inspirations for a tornado-proof suburb concept by Ted Givens of 10 Design in Hong Kong. 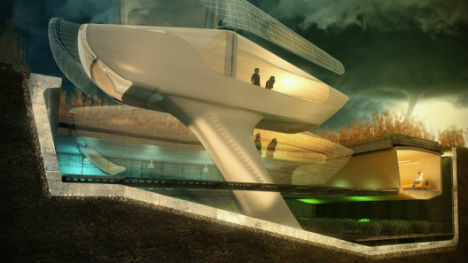 Entitled ‘Erupting Stability’, the concept explores ways to apply kinetic design to architecture to provide safe shelter in unsafe environments. 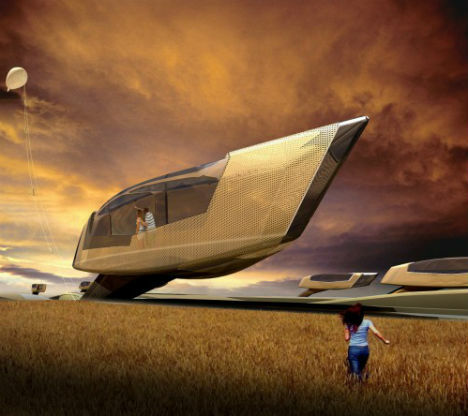 Assessing the damaging forces of tornadoes and high-velocity winds, 10 Design created a plan for a neighborhood that features futuristic pod-like homes that descend into the ground when threatening storms approach. 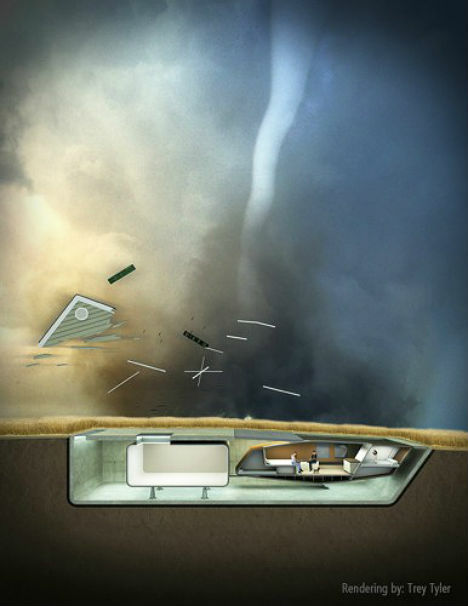 The hydraulic levers also control the outer skin of the buildings, which can change in response to environmental conditions like high-speed winds. Acting as a passive weather barrier, it consists of clear insulation between two layers of kevlar that allow light to penetrate into the interior spaces. The response of the building itself and the entire neighborhood – which can collapse in seconds in response to warning sirens indicating extreme weather threats – is designed to mimic the way a living organism reacts in the same situation. The community has a collective response, behaving as a singular organism, passively protecting itself from harm. Givens is currently developing a prototype in collaboration with a group of ship builders.